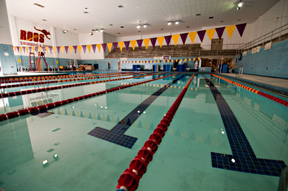 Hannah Natatorium is a multipurpose facility for use by the college community. It was the gift of David and Catherine Hannah of Houston. This competition-level pool with a seated balcony for spectators can by used for anything from water aerobics and safety training to a swim team competition. The natatorium contains a sauna bath, men’s and women’s dressing facilities and an office for the staff. As well as a center for competition, the natatorium is a place of leisure for students, with an adjoining patio area for cook-outs and receptions. See the facility hours of operation.